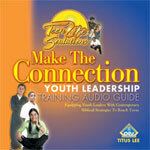 Make The Connection equips adult youth workers to "connect" with teens in a relevant manner through seven leadership units. Make The Connection provides them with practical strategies and tools that empower them to effectively reach and teach teens. The in-depth information and strategies that are in Make The Connection can be applied by those who lead: teen classes, youth groups, after-school programs and more. We recommend using Make The Connection in the following ways to empower your youth workers. Make The Connection gives new youth leaders contemporary strategies that are needed to successfully impact teens on a weekly basis. 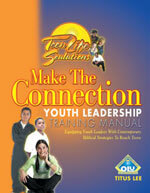 It can be used as a seven week orientation for all new youth workers. Make The Connection can be used to sharpen youth workers as they work with teens through out the year! We recommend completing a unit of study every other month if you choose to take this approach. Make The Connection can be used as a class that equips adults to mentor teens in your community. Many adults desire to learn ways to reconnect with this generation of teens. Therefore, Make The Connection can be an excellent base of preparation for the adults in your organization or ministry to re-engage.